Internationally-renowned refractive and cataract surgeon Dr Noel Alpins AM has just released a new book which highlights his world-leading approach to the analysis and treatment of astigmatism. 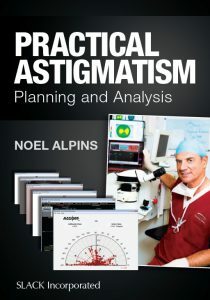 The book—Practical Astigmatism, Planning and Analysis—was released in September this year and provides a comprehensive guide to the ophthalmologist’s internationally-recognised Alpins Method for analysing astigmatism. Astigmatism is a common eye condition that causes blurred vision at both near and far distances. It is estimated that 1.3 million Australians are affected by astigmatism, making it the third most common adult eye condition in the country (after long-sightedness and short-sightedness). The Alpins Method was first introduced in 1993 and uses vector mathematics to determine the effectiveness of correcting astigmatism by laser refractive surgery and cataract surgery. The method recognises the need to define an astigmatism goal, allowing the surgeon to obtain precise measures of the magnitude and the angle of surgical treatment required. Widely recognised as a significant breakthrough in astigmatism analysis, the Alpins Method has been adopted by leading peer reviewed journals, as well as the American National Standards Institute, as a standard for reporting astigmatism results. Based on more than 20 scientific papers authored by Dr Alpins over two decades, the book also tells the behind-the-scenes story of developing the innovative Alpins Method. Dr Alpins says developing, expanding, refining and explaining the Alpins Method has been a 20-plus-year journey. “Despite the fact I first described the basics of this method more than 20 years ago, and have had more than 20 scientific papers published in major scientific journals internationally, I felt there was a need to bring it all together in one comprehensive and definitive book,” Dr Alpins said. “The aim is that it becomes a really useful textbook for doctors, scientists, laser vision correction technicians and other people who have an interest in the subject to be able to understand the method and the treatments better, and at the end of the day, treat people’s eyes better,” he said. Published by New York publishing group Slack Inc., the 250-page book, complete with diagrams and pictures, will also be printed in a number of languages including Mandarin, French and German. It has been endorsed by world-leading ophthalmologists, including the past president of the American Society of Cataract and Refractive Surgery, Professor Spencer Thornton, Professor Dan Reinstein and Dr David F. Chang. “Noel is an original thinker who took on and conquered the complexities of astigmatism analysis,” writes the London-based, Professor Reinstein. “Now, Noel has organised his many significant contributions into a single comprehensive textbook—a practical road map to navigate our current clinical options,” Dr Chang says. Dr Alpins’ contributions to ophthalmology began long before he first described his internationally-recognised method. The Melbourne-based surgeon first began performing refractive eye surgery in 1985, and has was one of the first ophthalmologists in Victoria to start performing laser vision correction in 1991. To find out more about laser eye surgery at NewVision Clinics, please call 1800 20 20 20. Byline: Rachel Wells is an experienced journalist who spent 15 years writing and reporting for The Age and The Sunday Age.